This project is officially one of the four projects shortlisted for the KBB Review Award for the Residential Bathroom Design of the Year. With our firm being only 11 months old, we have a lot to be proud of in our first year. Our client wanted a contemporary feel with nice dark tones to enjoy a nice relaxing soak in the bath. Lighting was very important and had to be designed to create a euphoric atmosphere. We worked side by side with Chelsea Mclaine Interiors, an established design firm that professionally designed the rest of the client’s home in order to ensure our design and use of materials complimented her expertise. From a mosaic shower wall to ambient lighting, this space is comprised of a combination of defined areas, which serve as both showpieces on their own and compliment exceptionally well together to create this tranquil scene. Our client wanted something that would tie in with the style of his traditional property and his love of artwork, so we incorporated our Vintage Copper Bath as a main focal point and created adequate space to hang his favourite portraits to encompass a warm and relaxing feel. This completed project has been a considerable highlight on our social media and Houzz due to its intrigue and allure. Emma Ellson, a renowned Scottish architect and business owner, asked us to design a soothing space featuring our Vintage bath along with our most elegant elements. Impressed by our two free-standing Bagnotech stone basins, the “Faith” model, from our showroom, we happily incorporated them into the space. To add that extra allure, we went the fully tiled route with Spanish porcelain and even added the Kyoto thermostatic shower column that has been featured in interior design magazines such as Homes and Interiors Scotland, designer kitchen & bathroom, KBBReview and other worldwide publications. We had to swing in the Vintage bath through the window from the outside. Thank goodness we did it without harm. In order to create that hotel feel we designed two identical ensuites with feature LED lighting using our Urban mirror which casts amazing shadows over the ribbed porcelain tiles. 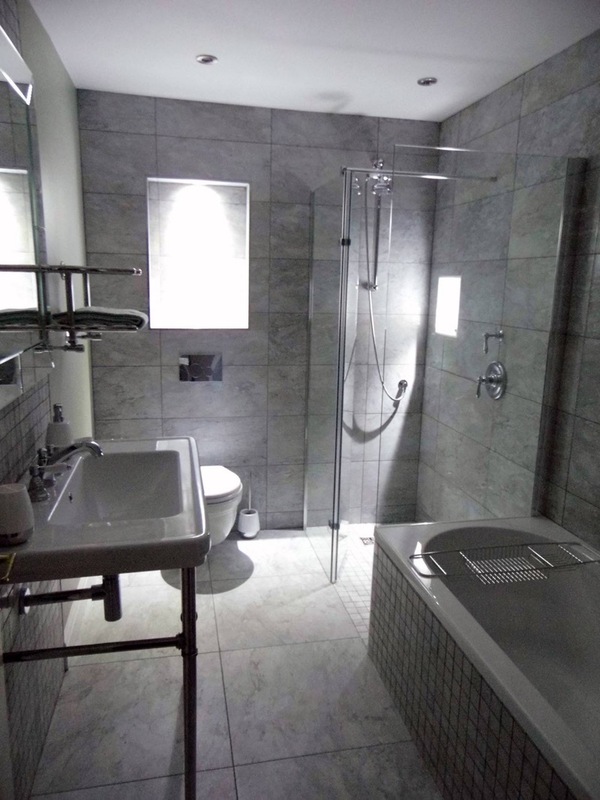 We even added a large walk-in shower with concealed valves similar to what you would find in a boutique hotel if you were to be updated to the luxury suite. 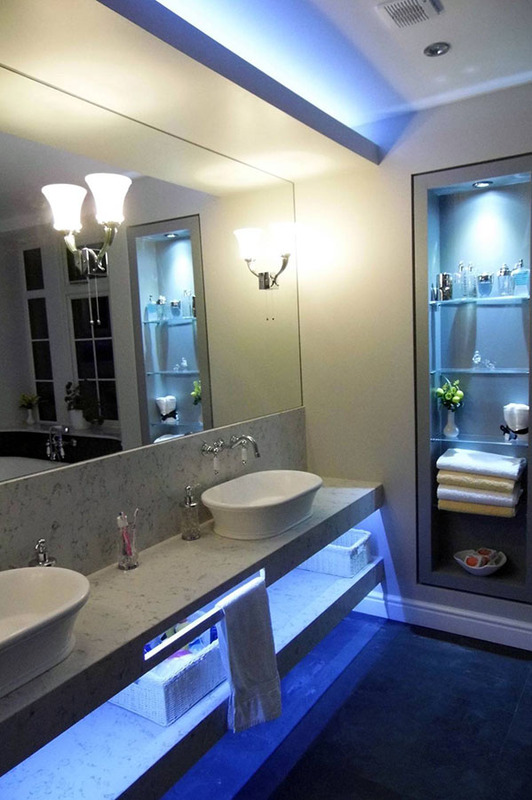 A wall-mounted WC and vanity unit helped give the illusion that this room was even larger than it was. This bathroom design was very simple, straightforward and without fuss, but due to the high quality of the BAGNODESIGN products an opulent atmosphere was easily achieved. 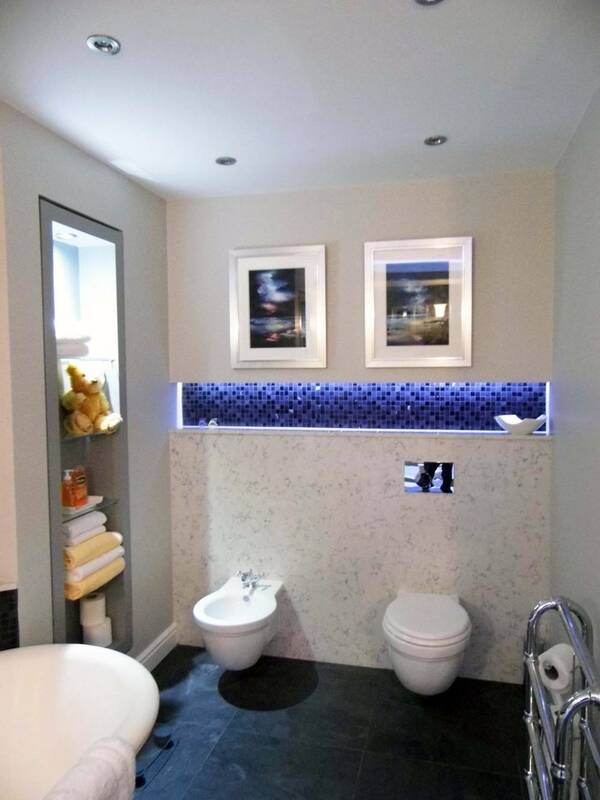 This bathroom was designed for a lovely young couple of restaurant owners truly in need of a relaxing space to recover from their busy workday. We accomplished this with the use of an ambient blend of natural and LED lighting accompanied with a glistening feature tile and alcove. 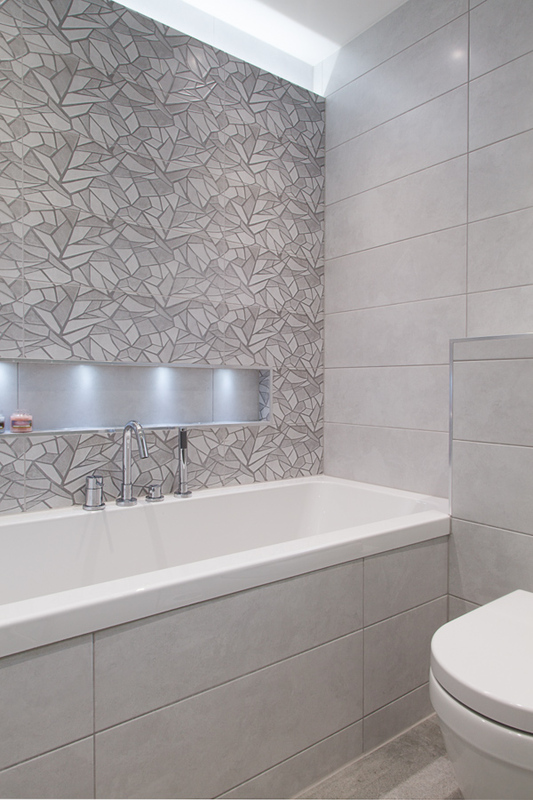 The bathroom is now our clients’ most idyllic area in their contemporary abode.